File size 4 Mb Searchable PDF document with bookmarks. The YD engine is a 2.2 L & 2.5 L Diesel I4 piston motor from Nissan. It has a cast iron block & aluminium head with chain driven DOHC. Winner of the FY 1998 Sho-Ene Taisho (The Energy Conservation Prize). The YD22DD is utilized in the Y11 Nissan AD van& W11 Expert. It is a non turbo engine utilising the VP44 electronic controlled rotary injection pump. The YD22DDT is utilized in the X-Trail, N16 Almera. It features the VP44 electronic rotary injection system and wastegated turbochargers. The VP44 pump models are easily spotted due to a flat acoustic cover over the motor. The YD22DDTi was a commonrail diesel introduced in 2003, during the first little facelift of the P12 Primera, N16 Almera and V10 Almera Tino. It ian additionally fitted to the Nissan X-trail. The injection system is commonrail with a variable vane turbocharger is intercooled and produces the most torque and power of all the YD22 engines. Cars with this commonrail engine generally carry the DCi badge. The commonrail version is easily distinguished from the VP44 model by the 4 injector bumps on the top of the acoustic cover.Non intercooled versions of this motor were also available with a reduced power rating. This motor features the VP44 rotary injection pump and is turbocharged and intercooled. In the Presage/Bassara it is fitted sideways with a variable vane turbocharger (garrett GT1749V) and torque is limited to approximately 280 NÂ·m (207 lbÂ·ft) accommodate the 4 speed automatic gearbox attached. In the D22 Navara/Kingcab/Frontier the engine is essentially the same other than modifications to mounts, plumbing system and accessories to accommodate the longitudinal engine layout. The turbo is a wastegated IHI RHF4 which is also intercooled. The stronger gearbox allows it to produce more torque than the Presage/Bassara version. The model description YD25DDTi technically refers to the YD25 engines which use the VP44 rotary electric injection pump and run injection lines to each cylinder. 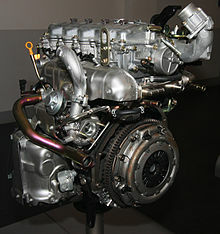 This DDTi engine had been last utilized in the the D22 and Presage/Bassara navara.The common rail versions of this engine are referred to in Europe as DCi. The commonrail engines are used in the D40 navara, late model D22 navara and the R51 pathfinder. This is the engine referred to below.YD25DDTi High Power had been developed in 2005 for the Nissan Navara (D40an as well as the Nissan Pathfinder (R51). It at first produced 126 kW (171 PS; 169 hp) @ 4,000 rpm and 403 NÂ·m (297 lbÂ·ft) of torque. In 2010, Nissan updated the engine for the Nissan Navara (D40) and Nissan Pathfinder (R51) facelift to create 140 kW (190 PS; 188 hp) and 450 NÂ·m (332 lbÂ·ft) of torque. In 2011 the Nissan Murano was fitted with the updated engine creating 140 kW (190 PS; 188 hp) and 450 NÂ·m (332 lbÂ·ft) of torque.